I made this cake for my Granddaughter's birthday. Her invitation had an owl with the same colors, so I used it to design the cake. Since I haven't been doing cakes all that long, I did not know if I could carve an owl so I went to my local cake shop and they had an owl pan by CK. After getting the cake pan home I put two boxes of cake mix in the pan and it came out great and the details were formed nice on the cake. After the cake was cooled, it was time to start icing it. I have been using a medium consistency butter creme icing. It is Wilton's recipe. 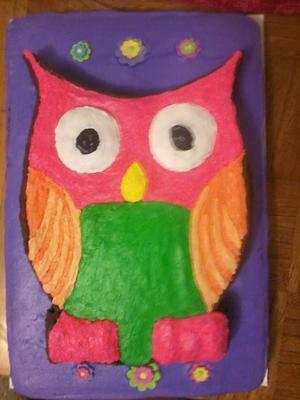 First, I iced a half sheet cake in purple for the background color then placed the owl on top. Now with pink being the biggest part, I started with that following the out lines on the cake. Then I filled in the green and let this crust over and smoothed it out some using a Viva towel. Then I cut in the eyes, nose and did the wings last using two different colors so it would have some definition. I did not smooth it out completely so it would look a little rough like feather's. I took it to my Granddaughter and she loved it.